I had the opportunity to continue preaching in our Revelation series at Risen Life Church and at Gateway Community Church. Below is a brief synopsis of my sermon on the letter to the church in Ephesus from Revelation 2:1-7. I encourage you to listen to the sermon HERE for more detail. 1. There is an address to the angel of the church by Jesus mentioning one of His name’s that has already been described in John’s vision that will answer each church’s situation. 2. Then there will be a spiritual appraisal of the church. 3. Followed by praise or reproof. 4. Then words of exhortation. 5. Promises to the overcomer and a command to hear what the Spirit of God is saying. I think it is important for us as modern day Christians to realize that these letters were written to regular churches with regular problems. We could insert seven churches from around the US and similar things would be said. It is also important to see that Jesus jealously loves these churches and is committed to helping them grow and become exactly what he wants them to be. This should bring us comfort even today as we look at our own church. 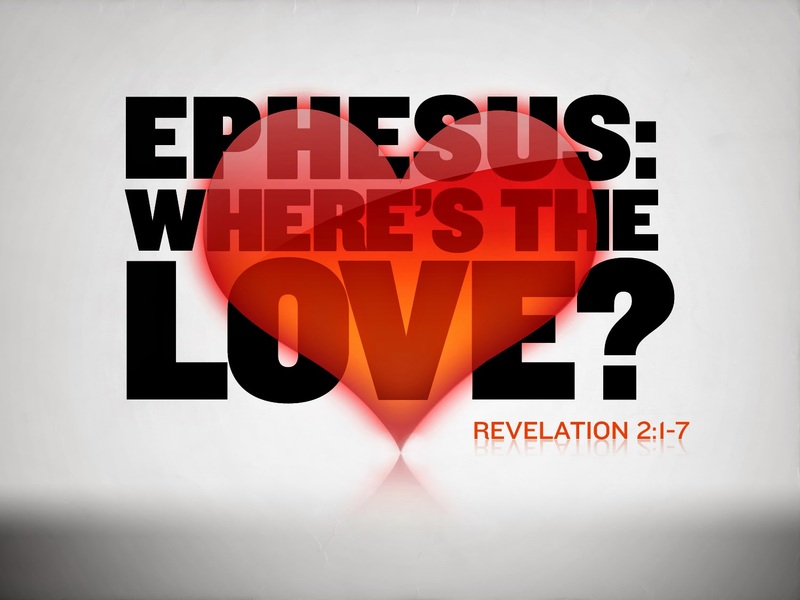 Revelation 2:1-7 is written to the church in Ephesus. Ephesus was an important church in an important city. Paul had taught there, Timothy had taught there, and John had taught there. It was really the mother church planted by Paul in Asia. It was an important city in the Roman Empire and boasted a population maybe as big as a quarter million. I would encourage you to do a little reading on Ephesus. Jesus Declares His Name. In Revelation 2:1 Jesus declares himself as “Him who holds the seven stars in his right hand, who walks among the seven golden lampstands.” Here Jesus reminds us from the outset of this letter to the Ephesians that we are not in control of His church, He is. Even if we see things at church that we don’t like Jesus declaration of his name reminds us that our zealousness for the direction and righteousness of our church must yield to Jesus as the ultimate authority. How are you doing letting Jesus guide and direct the church you are a part of? What the Ephesians are Doing Well. In Revelation 2:2-3 Jesus recounts what the Ephesians are doing well. He speaks good words! Words that all of us should desire for Jesus to speak over us! We are reminded by Christ’s words that we always want to work for an audience of one and that is Christ, because He sees, and He is the only one that matters. So let me ask you, are you, like the Ephesians, standing against evil? Are you striving to live a life of holiness and urging others to do the same? Do you know your Bible enough to know when you are facing untrue teaching? Are you patiently enduring, continuing faithfully trusting in Jesus while you wait for his return? If not, maybe take a lesson from the church in Ephesus. What the Ephesians are not Doing Well. In Revelation 2:4-5 Jesus lays out His accusation against the church in Ephesus. The problem is that they have abandoned their first love. After laying out the problem Jesus then gives the remedy: Remember, Repent, and Do. Remember the relationship and zeal you had for Jesus when you were first saved and realize how far away you have drifted. If you are feeling dry in your Christian walk, Jesus says remember! Remember what it was like when you were all in for Me and We were close and lets get back there. If you have lost your first love Jesus is saying seek My face! I have given you a new vision of Me as the Risen Lord. See Him again for the first time in John’s vision in Revelation 1:12-16. He promises if we will remember and seek Him we will find Him. Then Repent of your sins. 1 John 1:9 is a great verse to memorize here. John tells us if we will confess our sins Jesus will be faithful to forgive us and cleanse us. Then you are to do what you did at first. This means studying and reading your Bible, praying with all your heart, striving for holiness, committing yourself to a local body of believers in a church, and telling others about the Gospel. A Word of Warning. In Revelation 2:5 Jesus gives a word of warning. It is a terrifying warning that Ephesus will cease to be a church if they do not repent because He will remove their lampstand. When we think about our Christian lives, this is not just some religious game or feel good club. But our Christian lives are important and are made up of real decisions with real important consequences and rewards. If we cease to listen to Jesus, how can we be His? Let me encourage you to listen to Jesus and repent of the things He asks you to repent of. If we listen and submit to Him we have no reason to fear before our King! Persevere and Conquer with Christ. In Revelation 2:7 Jesus is saying, “If the holy Spirit is speaking to you, Listen!” If you will persevere in Me, if you will head My words you will conquer with Me. The Gospel is all about Jesus anyway. We do not conquer by mustering some feeling or obedience out of our own heart, but rather we turn our eyes to Jesus and continually get a fresh view of Him, ask Him to save us, to empower us, and to keep us to the end. He is the one who conquer sin, death and the grave through His sacrifice, and when we say yes to Him as master and Lord we conquer with Him. There is great reward for those of us that will continually turn to Him in repentance. Jesus promises that if we will heed His words, and persevere in our Christian walk until the end, we will eat of the tree of life, which is in the paradise of God. Jesus has written a letter to the Ephesians warning them that they have lost their first love and exchanged it for something else. Is Jesus calling you to return to your first love? Remember, Repent, and do the things you use to do and you will conquer with Him and live eternally in His paradise. *The image above was used in accordance with the licensing agreements of Gracewaymedia.com and in no way reflects the views of the artist that produced the image.